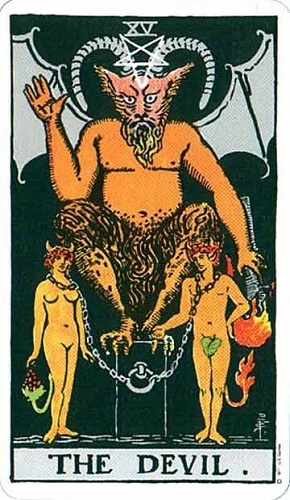 Though fearsome, and symbolizing many harmful patterns and ensnarements, the “Devil” of the tarot is essentially neutral. It represents the physical world, and earthly desires – which can be wonderful, but aren’t everything. It warns against staying in the dark, being bound to those desires, or blind to your problems with them. The presence of this card can be a wake up call – to assess whether you’re using your worldly gifts to your advantage, or if they’re controlling you.